Calgary is not exactly California when it comes to growing conditions but there are still a number of tasty fruit you can grow here. When it comes to Fruit you can grow in Calgary you will want to choose plantings that give you the best yield for the area you are using to grow them in. Also, choosing crops that are native to the prairies is your best option to ensure minimal winter kill. Here is a list of our favourite fruit you can grow in Calgary. Growing strawberries in Calgary is actually quite easy if you plant your strawberry beds properly. Strawberries are one of the healthiest fruits you can eat and you will commonly see them in most top 10 lists for most nutritious fruits in the world. Strawberries are tasty when eaten fresh and they freeze will so you can enjoy them year round. Growing strawberries in lush wide mats by letting them runner is a great way to increase yield. Also, picking the white buds in the first year will help increase plant strength and running of the baby plants. If you don’t have the space you can grow your strawberries in hanging pots, hay bales or other containers. Visit our Growing strawberries in Calgary page for more. Saskatoons would be at the sides or back of your property where full sun is available. Saskatoons bushes can grow well as hedges but don’t plant them too close to the street or your neighbours will reap the rewards of all your hard work! Eating apple trees are in abundance in Calgary and new varieties from growers means more yield. Apple trees not only create great eating fruit by they have beautiful spring blossoms for you to enjoy. Of all the fruit you can grow in Calgary, apple trees will likely be your greatest producer. You are likely to have plenty of left over apples and these can be used for Apple sauce, Apple pies and many other deserts that can be preserved over winter by freezing them. There are many great eating apples including the best eating apples to grow in Calgary include Honey Crisp and Parkland. The haskap is incredibly hardy and built for Calgary’s climate. Often called a Honeyberry, these prairie hardened plants can survive temperatures colder than -50c. The Haksap berry bush can grow to 7 -9 feet, they produce a lot of fruit and are very high in fibre. Native to Europe and Asia, the Haskap is used to very harsh climates. Haksap berries look similar to oval blueberries. The berries have their own unique taste that is a cross between blueberries and cranberries. This is a wonderfully unique fruit that will surprise you with its hardy rich cast. Like Saskatoons, you will need to find a sunny place in your yard to grow the Haskap bush. If you like semi sweet tart cherries then you will love the Evans Cherry. These cherry trees have prolific flowers in the spring and produce an abundance of juicy cherries. Plant your Evans cherry tree in a sunny location to ensure the best yield. They do not like soil that is overly moist so make sure the chosen location is not on a low area of your yard. Evans Cherry can be planted in groupings if you have the room for that. They are a wonderful ornamental style tree that will give you beautiful colour in spring and bountiful crops in late summer. 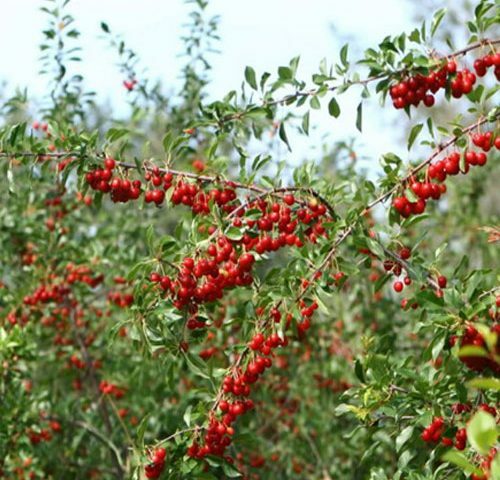 Evans cherry are one of our favourites on the list of fruit you can grow in Calgary. They are nutritious, plentiful and delicious. See our article in Avenue Magazine for more information on Fruit you can grow in Calgary.